A pre-engineered metal building uses the most recycled substance in the world: steel. For the environmentally conscious, making “green” steel buildings using metal to frame a commercial building is a no-brainer. For example, let’s say you are planning an 80’ x 125’ single-story commercial building. The structure would require 200-250 trees to produce the lumber for the framing. That is about five acres of forest, sacrificed for just one commercial building. The same 10,000 square foot building could be framed with the steel recycled from about 30 scrapped automobiles along with other eco-friendly building materials. Which would you prefer to leave on the landscape: five acres of natural woodlands sucking up carbon dioxide and replenishing our atmosphere with oxygen— or 30 old crushed cars? What about renewability? Can’t you just plant more trees? Yes, of course you can. Then you can wait… and wait… and wait. It takes a Douglas Fir 80-125 years to reach only 18” in diameter. The Longleaf Pine requires 100-150 years to grow to full maturity. Even the fast-growth trees need 30-35 years of growth before harvesting for lumber. Yet steel producers manufacture a ton of recycled steel in only two man-hours or less. Current demand means trees must be harvested long before reaching full maturity. Immature trees produce less dimensionally stable lumber. Steel has a ready supply of scrapped steel from old cans, cars, bridges, buildings, ships, appliances, railroad cars, and the like, which can be recycled again and again to make more steel— without losing any integral properties or strength. For example, the steel industry recycles over 19 million metal cans every year— 600 cans a second! Ask a RHINO metal building specialist how our green steel buildings save not only the environment using eco-friendly building materials, but also save the “green” in your commercial building budget. 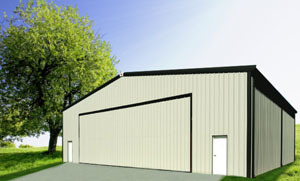 For more information about our green steel buildings, please call RHINO: 940.383.9566 today. Share the post "Go Green with a Pre-engineered Metal Building"